Chutney is a Hindi word used now all over India and also has been included in English vocabulary. It refers to a dish made out of ground vegetables, fruits or lentils etc along with spices. It is a side dish and served along with Rice or Rotis, Pulaos and dishes served at Breakfast like Idlis, Dosas and tea time snacks like Samosa, Bhujia etc. Chutneys are called as Pachhadi in Telugu. These are prepared and served fresh and will not keep for more than a day or two. These cannot be preserved. Very few chutneys can be preserved upto a week or fortnight at the most. Compared to Pickles these are more healthy, as less oil, salt and no preservatives are used. They are made and served fresh every day. Use of fresh vegetables, fruits or other ingredients makes it more nutritious and healthy. The quantity of oil and salt used in chutneys can be reduced to very little as compared to the traditional methods to make it more healthier. There are some recipes which are oil free. I will be posting recipes of many chutneys in the coming days. The Chutneys from North are more sour or tangy and there are also some sweet ones too. Where as the ones from South India are spicy. Andhra is specially known for its pickles and chutneys.Chutneys are wet and coarse to smooth in texture and its consistency may also vary from very thick semi solid to almost pouring consistency. 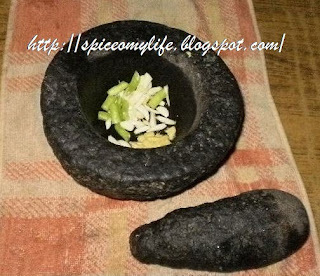 Traditionally, Mortar and Pestle made of stone were used for making the chutneys. In Andhra a stick made of wood known as Rokali is used for making of chutneys. The stone mortar is known as Rolu and the pestle is known as Pothram. Now other gadgets like Blenders are being used. This is a stone or granite Mortar. Very small one with the pestle. Its generally used for grinding, ginger, garlic, chillies etc into paste or for powdering various spices. These mortars are in various sizes and some are very huge like the one in my Grannie's back yard. It was used for grinding soaked lentils and rice for making Idlis, Dosas or vadiyalu (badis) or powdering of dried chillies, turmeric, mustard etc. It was also used for pounding rice grains to remove the husks. Medium sized ones are now used by nuclear families. The snack made out of the batter grounded by using the stone mortar is much much better than the blenders and food processors. Chutneys are also much tastier. This is the wooden stick like object used for pounding or powdering. This also has a metallic( iron) ring at the bottom. Though mine doesn't have one.